In my most recent post, I talked about one of the most underrated plugins for WordPress backups. If you didn’t read it yet, read it now and then come back to this one. So if you’re reading this post, it’s safe to assume you’re not just running a single site. I run about 20 sites at the moment. I came across UpdraftPlus while looking for a backup solution that I wouldn’t have to interact with much – and it does that very well. But, it turns out UpdraftPlus can do more. Especially when you have more than a single WordPress site to manage. The makers of UpdraftPlus also make a website management plugin called UpdraftCentral. With UpdraftCentral, you can manage all your websites from one dashboard. 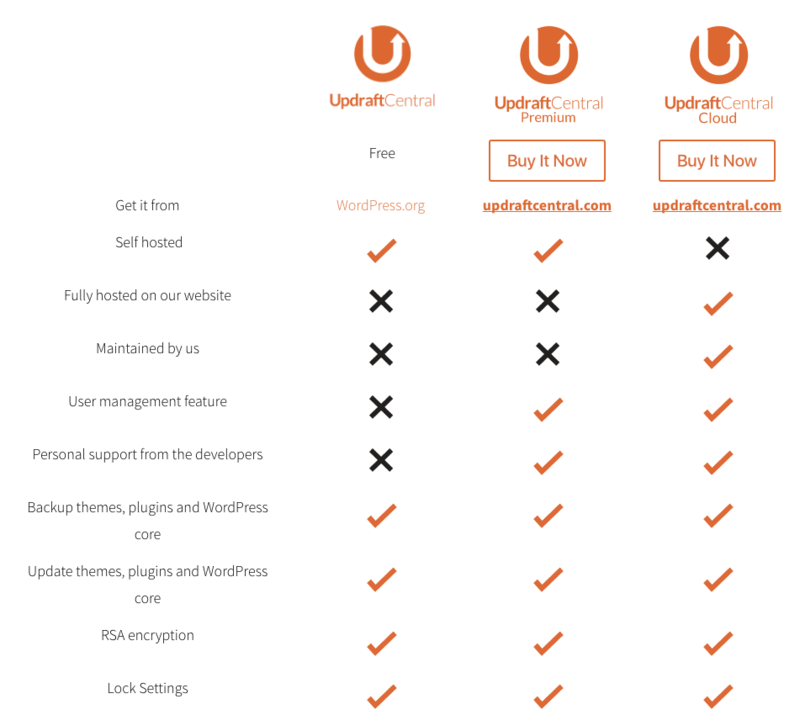 Unlike other WordPress management solutions which require you to connect your sites to their cloud-based systems (which presents a security concern), UpdraftCentral can run on a self-hosted site. Communication between your ‘master’ site and the sites you manage is encrypted with unique keys for security. UpdraftCentral runs on the front end of your WordPress site, but it’s only accessible to logged in users with the appropriate role. It’s nice to be able to do all your dashboard management tasks without having the WordPress dashboard elements to distract you. To set up the plugin, just create a page on your dashboard WordPress site and paste the appropriate shortcode. While the interface isn’t exactly a work of art, you can modify it with custom CSS to get the color scheme you want. The sites you manage must have the UpdraftPlus backup plugin installed and configured. You’ll create the keys to connect to your UpdraftCentral dashboard from within the UpdrafPlus backup advanced settings on each site. While UpdraftCentral is still a free plugin, the features are fairly basic. They do however include some of the most useful & time-saving features. The sites you manage need to have the UpdraftPlus Backup and Restore plugin installed in order to connect them to your UpdraftCentral dashboard site. Once you add your sites to the dashboard, you can control the UpdraftPlus backups on them without having to log into each site. Your UpdraftCentral dashboard provides a couple other useful functions in addition to handling your backups. From your dashboard, you can scan all of your sites for updates with a single click. You can then install all of the updates without ever leaving your dashboard. Plugins, themes, and even the WordPress core updates can all be processed. If you’re big on keeping your sites up to date (and you should be), then the amount of time saved on updates is HUGE. One of the other nice features about UpdraftCentral is that it provides one-click access to the administrator portal to each of your managed sites. You’ll no longer have to remember separate passwords for each of your sites. Another nice thing about UpdraftCentral is that each WordPress user on the site has their own dashboard. This means you can control management of sites to certain groups within your organization. One of my clients has 3 sites that they host with me, so they have a login on my dashboard site and the UpdraftCentral dashboard page only gives them their 3 sites. If you’re concerned about security when it comes to managing multiple WordPress sites, the separation of sites among different admins is critical. Like most free plugins, UpdraftCentral has a premium version that provides more options. In my opinion, the premium version isn’t worth it – you really only get 2 extra features: the ability to manage WordPress users on all sites and better support. If you want to spend money, get the premium version of UpdraftPlus backup because that’s where you get a ton of features for a fair price. UpdraftCentral is a free lightweight management tool great for basic tasks on multiple WordPress sites. It can be set up in just a few minutes and will save hours upon hours of time. While there are other, more comprehensive solutions for site management, UpdraftCentral is definitely one to check out especially if you’re running less than 20 sites. If you’re interested in customizing the look of your UpdraftCentral dashboard, I also wrote a post on how to use CSS to change the colors to match your site theme better. Do you have any favorite management tools? Let us know in the comments.